It looks like the forums got a bit of work today. Am I the only subscriber getting ads? I wouldn't know. I use Adblock on all sites. Yeah! Like that, just like that! I see that all the time. I just payed it no mind. I ignore it too. Also, all emoticons are being forced down below the text line they are applied on. Like this... which should be right next to this... and not on the next line down. I noticed that on another post. The beer and pizza emoticons were lined up underneath each other rather than side by side. You guys should run Firefox with the extensions I am using. No ads. Zero. Tried Adbloc awhile ago. Kept messing with the browser. Pages would get all skewed and wouldn't load right even after clearing cache and cookies. Once I got rid of it the browser went back to normal. I logged out and back in and it took the opening page ad away, which led me to believe that the problem was corrected but then I open this page and, here it is again. they are doing site work so that could be the cause, hopefully it gets fixed. Correct me if I am wrong but even if I do see the ads one has to click the ads to generate revenue right? Advertisers want their products to be SEEN/KNOWN [and ultimately maybe bought]. It is why television, etc. has advertising......and no, you cannot/don't click on TV ads either. Removing the advertising using third party programs neither benefits the site through product VIEWS [not purchases] nor via the LEGITIMATE method of advertising removal - actually paying directly to support the site. I doubt I am the only one that uses Adblock. Ads are really annoying. I don't come here to shop. Also as a previous customer I shouldn't being seeing ads anyhow right? Only people who should not see ads are current WinCustomize Subscribers. Or previous customers. I thought that was a rule or I heard about that some time ago. Can anyone else verify? I am a current subscriber ID, and I am seeing the same ads, even after logging out and back in. Kona, I'm pretty sure I know what I'm talking about. You are confusing this with download caps. Ok, I'll add this to the forum issues so someone can look at it. 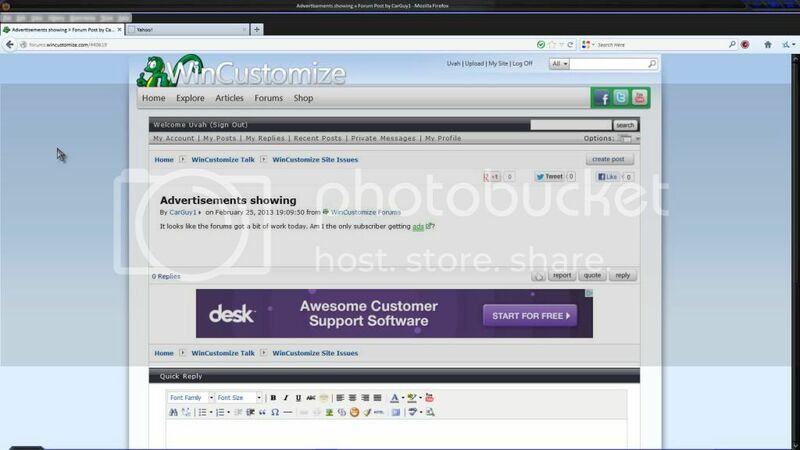 Curiously it is Wincustomize.com which enabled you to have a computer to access Wincustomize.com. The least one could do would be to be willing to help support the site through which they have benefitted so much. Quoting LightStar, reply 19I am a current subscriber ID, and I am seeing the same ads, even after logging out and back in. I confirm that. I see ads even after signing out, running CCleaner, rebooting, etc. Currently using a portable apps version of Chrome and the site works almost normally. Here and there a button out of place, but mostly good. Jafo I am supporting the site. I'm here, I contribute. The site didn't help me get this computer other than being the place we all talked about what we were doing or going to do. The awesome friends I have here made this computer possible. We could have done this via email. And as I said before, I am sure I am not the only one that uses Adblock. It is a top ten extension. Ads are intrusive and annoying. That one little ad isn't going to make or break anything. I'm neither offended nor annoyed by it even if I'm not supposed to see it. As long as everything works.....most of the time. I don't understand what the big deal is. I could understand if they were plastered all over the place but they're not. One dinky little ad....easy to ignore.